As with bulk wine and dispatches, you may occasionally need to reverse a stock action (receive, adjust, move, packaging, manufacturing, disassemble, etc.). This is very similar to reversing a bulk wine operation. Note: Packaging operations are an exception to this rule. See the section entitled “Reversing a packaging” at the end of this article. 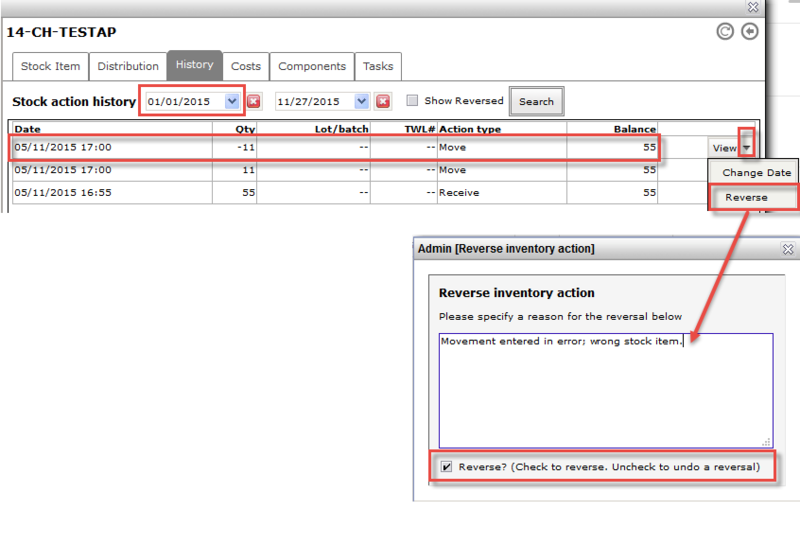 Head into Inventory – Search or use the Quick Search function to find your stock item. Head to the History tab. If you do not see the event you are reversing, you may adjust the Stock action history start date to an earlier one. From the drop-down list, choose Reverse. Enter the reason for the reversal and ensure that Reverse? is checked. If you return to the History tab and click Show Reversed, you will see the entries are struck-through to denote they are now reversed. You use this exact technique for all other stock operations except for a packaging. This is because packaging includes a bulk wine component, and, thus, must be rolled back and not just reversed. Use this option judiciously; as with any rollback, all bulk wine operations subsequent to the rollback are destroyed and you will need to re-enter all, including in this example, the second bottling of 5000 units.